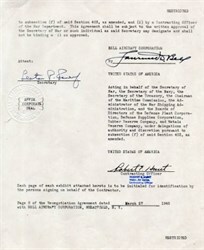 Signature page of an agreeemnt dated March 27, 1945 between the Bell Aircraft Corporation and the United States of America during WWII. The page is marked RESTRICTED on the bottom. The document is signed by Lawrence Bell, founder of Bell Aircraft Corporation and Major Robert E. Hunt, Contracting Officer for the Air Corps.